Most maid cafes aren't exactly visually striking. The decor lacks pizzazz. 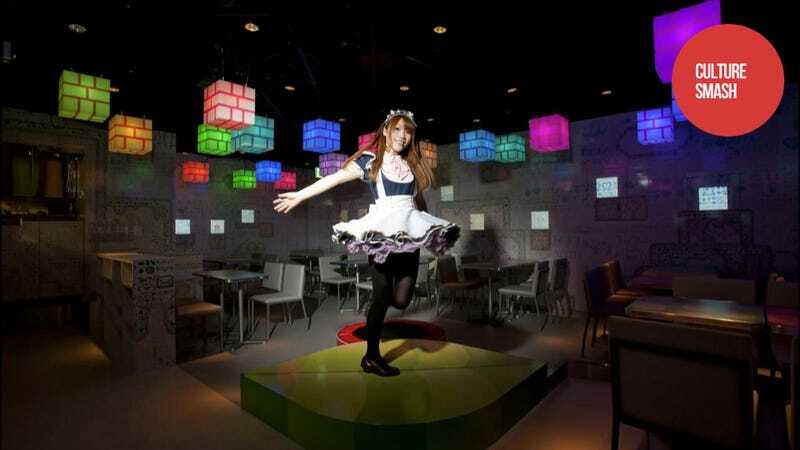 Japanese maid cafe chain Maidreamin has pizzazz out the wahzoo. The cafe is Mario meets maids, while guzzling electric Kool-Aid. It's a trip. Maidreamin has locations throughout Tokyo's Akihabara, but its Shibuya establishment and its new Osaka locale are stunners. They aren't your standard maid cafes, with young women playing paper-rock-scissors and severing rice omelettes. These are "digitalized cafes". Much like Nico Nico Douga's new Roppongi club Nicofarre, Maidreamin embraces technology and nerd culture. With maids. The level of Japanese gamer nerd detail on display here is intoxicating. The walls are covered with what look like moé Mario pixelated stage. Upon closer examination, they are made, no pun intended, from little Japanese emoji and icons. Hanging from the ceiling are Mario style blocks, illuminated like Japanese lanterns. When maids jump up and hit the blocks, they change color, while 2D video game versions of maids come to life with cutesy animations and Nyan Cat style music after hitting the blocks. These mini-maids are even standing on Mario pipes. When orders go out, the little 2D maids say things, like "Your cream soda is ready! ", "Whose? Whose?" and "I can't wait." It doesn't stop there. When maids jump on the "digitalized" trampoline, it emits a "nyan" (meow). And when maids storm the leaf-shaped stage, the 2D anime maids on displays through the cafe begin waving their hands around, while waving their little anime hands. That's what this cafe is, really—the interplay of our 3D world and the 2D game world. In Japan's otaku subculture, this isn't just where they intersect, but where they serve melon soda and jump on digitalized trampolines. All photos courtesy of Japanese website Gigazine.